A tale of loss told in five parts. Any good mom would march through the inferno of HELL to get her family back. Unable to cope with the burden of grief, a middle-aged mother descends the nine circles of hell to retrieve her forsaken family. Guided by the ghosts of William Blake and Agatha Christie, this no-nonsense matriarch journeys deep into a bizarre underworld filled with celebrity sinners, surreal landscapes and absurd tasks. From Lonnie Nadler and Zac Thompson, the writers of the break-out hit The Dregs and Cable, and Kyle Charles, the artist of Roche Limit, comes a journey through hell unlike anything you've experienced before. 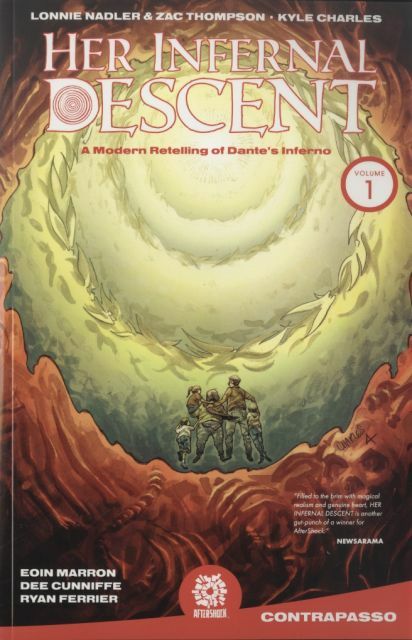 HER INFERNAL DESCENT vol 1 contains the complete first story arc, issues #1-5.